This post is sponsored in conjunction with ChristmasSweetsWeek. I received product samples from sponsor companies to aid in the creation of the ChristmasSweetsWeek recipes. All opinions are mine alone. This homemade creamy and crunchy Milk Chocolate Toffee Fudge is easy to make and perfect for giving as a gift at Christmas. Or, keep it all for yourself, I won’t tell! Welcome to day 3 of #ChristmasSweetsWeek 2018 hosted by Terri from Love and Confections and Christie from A Kitchen Hoor’s Adventures! You can read all about this weeks giveaway sponsors here. I get really excited about fudge. So excited, in fact, that I forgot to take step-by-step photos of the preparation of the fudge. Years ago, I would only have fudge once or twice a year, if that. My grandmother never made it, I taught myself when I got older and it’s not hard at all. 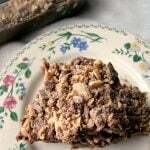 How do I make milk chocolate toffee fudge? Two tablespoons melted butter, one can of sweetened condensed milk, a bag of milk chocolate chips, and vanilla extract . Melt butter in a medium-size pot, add in the sweetened condensed milk and the chocolate chips, whisk constantly until the chocolate is completely melted, then turn off the heat and whisk in chocolate toffee bits until the additional chocolate is melted. Pour into a square glass baking dish. Top with additional chocolate toffee bits, and refrigerate uncovered until hardened. Need more chocolate recipes for Christmas? Try these! 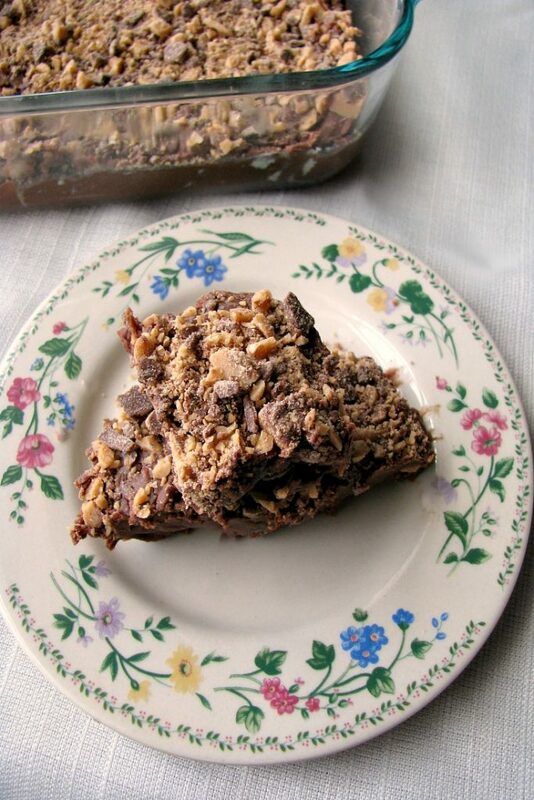 Read on after the Milk Chocolate Toffee Fudge recipe to see all the other #ChristmasSweetsWeek recipes shared today! This homemade creamy and crunchy Milk Chocolate Toffee Fudge is easy to make and perfect for giving as a gift at Christmas. Or, keep it all for yourself, I won’t tell! Grease a square baking dish or cake pan lightly with butter, set aside. In a medium saucepan, melt the butter over low heat. Stir in the sweetened condensed milk (scrap the can to get it all), vanilla, and milk chocolate. Whisk constantly until all of the chocolate is completely melted. Turn of the heat and whisk in 4 ounces of the milk chocolate toffee bits until the chocolate is melted. Pour the melted chocolate mixture into the prepared baking dish. 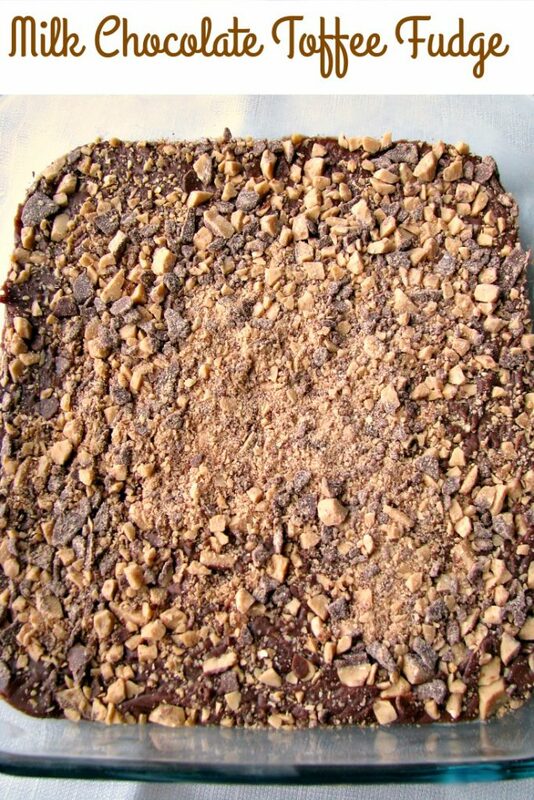 Sprinkle with the remaining milk chocolate toffee bits and light press them into the fudge. Refrigerate, uncovered, until hardened, at least 2 hours. I love making Italian cookies with red and green sprinkles. I love trying new things too! Ginger cheesecake is delicious.